I'm one of those writers who really cannot remember a time in my life when I wasn't writing. This may be frustrating to those who come to writing late in life – I am brand new to the fiddle, and sometimes, when my fingers just won't do what I want them to do, I bemoan the fact that I am SO OLD a starter. Alas. Please know that there is no wrong time to come to something like writing (or fiddle), and that being an early writer gives me no advantage and means nothing in terms of likelihood for a successful career or anything else. It's just my story. I cannot conceive of “me” that doesn't include pencil and paper. My first written works were love poems --for my mother. I was 4. When I was a teenager, I became dependent on writing as a means of tunneling through the diamond mine of feelings, each so sparkly and new and brilliant, there were not enough notebooks to contain me. And, like any miner, I worked in the dark. I was furtive about my writing and rarely shared it with anyone. It was too personal, too revealing. What would people think?? I read through those pages and try to rediscover the girl who wrote the words. It's scary, and I can only do it a little at a time. Sometimes I wish I wrote more in notebooks, because I do love the idea of it. But, as you can tell, my handwriting is not always legible. And I am so much faster on the keyboard! Also, for poetry, I love the instant gratification the keyboard grants for rearranging words and lines and trying different line and stanza breaks. But, when I see my own handwriting, I feel such tenderness for myself and my inner world – it feels more vulnerable somehow, and it makes me want to do it more. Also, you might be interested to know that I prefer PENCIL to pen... I need a clean page, so erasing is better for me than marking out... though it's less useful in terms of sharing my process in a blog post like this! In my experience, art inspires art. Today, when you pop in your headphones to listen to favorite music, grab your notebook. Write down whatever lines speak to you. Then, go back and make those lines your own by changing a word here, adding a phrase there. Allow the words to flow through you, and you will discover your very own song! Thank you, Amy, for inviting me to share my notebooks! I love peeking in on the many, many ways people live the creative life. This post made me smile for a million reasons. I enjoyed the story of your writing life, Irene. You made me smile over the memories of teachers that had us write in our journals and any teacher that used the words "creative writing" to define an activity. I loved when you said, " I love the instant gratification the keyboard grants for rearranging words and lines and trying different line and stanza breaks. I love hearing about your early years, Irene, and the teachers that helped you by asking for journal writing. It's wonderful to see that you found that early page for Dear Wandering Wildebeast & the title already in your thoughts. And Cathy took my favorite words, about the way you feel tenderness for your handwriting, the girl you were when it was written! It's special to contemplate a writing life, so hope others are inspired to think of their own when they read this. Thanks Irene, and Amy, too! I love the fact that you, too, have a stack of "summer journals", "English class" journals and other hand-me-downs from your kids. I've worked my way through most of the physics and biology spiral-bound notebooks to the marble-covered ones... and can see, there at the bottom of the pile, a mostly unused spiral sketchbook with a dragon on the cover. Inspiration to write more just to get to it! And the whole rubber-banded file of loose pages- love it! mine aren't nearly that organized. Thanks for sharing your notebooks! Irene, I enjoyed reading about your writing notebooks and your process. Noticing similarities and differences between my own reinforces the importance of giving my students options when they write. Just as "there is no wrong time to come to...writing," there is no "wrong" way to get our thoughts on paper (or screen). 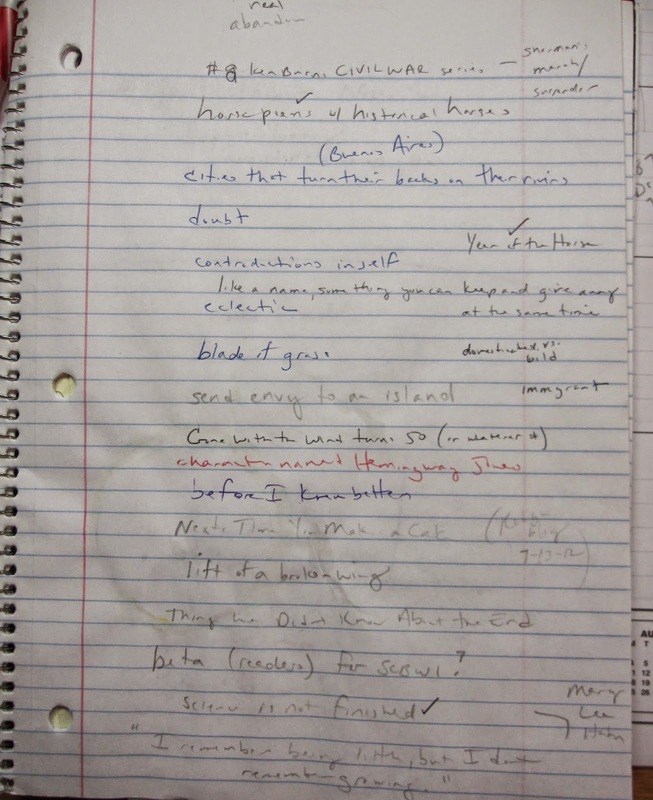 The important thing is that we're writing. Thank you for sharing your journals with us, and to Amy for providing this space! Keep posting peeks as inviting as this one, Amy. I also appreciate knowing that Irene's very young child days mirror her writing intensity of these days. It's a bit of bliss to consider others' odd notes & ramblings on various sections of paper or spiral kids' book. 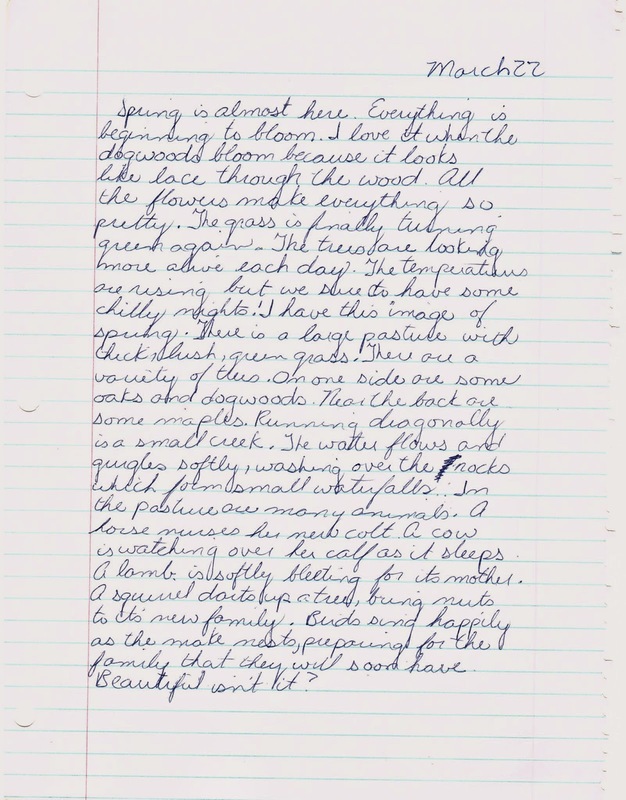 Amy and Irene, this was a wonderfully informative post that made me think of my own notebook from childhood. I imagined myself a writer of novels and created a few chapters based on the text, The Bobbsey Twins. Who knew when I was 8 that what I was doing was using a mentor text to guide my writing. Thank you for calling up memories and giving us a peek into the life of a writer via notebooks. Thanks for sharing your inspirations, past and present! 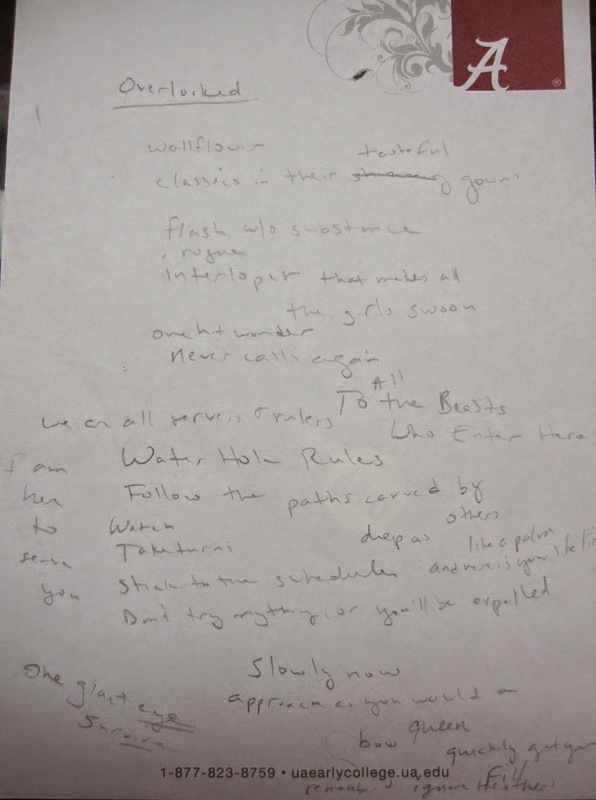 I agree, that so much of life can pass you by if you don't jot something down quickly...and I've found that now that I'm writing even more, I'm paying more attention to rhymes and structure in other poems, songs, and even conversations! Thanks so much for posting this, Irene (and Amy.) You really struck a chord when you mentioned feeling tender about the girl you were, seeing her in that early handwriting. We are there, aren't we, in our early notebooks - not only in our thoughts but in the way we crossed our t's or looped our g's? Wonderful post. Very instructive and fun. Thanks for sharing your writer's journey and use of notebooks and photos. Congratulations on a great collection of poetry about Africa's animals at the water hole. Thanks for sharing nature's magic even on a busy day traveling. Please enter my name in your drawing. Thanks! This is exactly why I keep writing notebooks, and the reason I keep notebooks at the very center of my writing workshops. I want my kids to feel this way, too! Irene, your notebooks remind me of mine-- messy hand-me-downs from my children, mine with post-its scattered throughout as markers that this bit has potential and I should come back to it. I loved reading your handwritten young masterpieces-- especially the love poem to your father. Hands have always been special to me as well. This is a beautiful series, Amy... so insightful. Thank you Amy for sharing Irene's life in notebooks. I myself have a huge collection of notebooks that is now getting unwieldy - most are blank and waiting for words to visit their pages. I enjoyed reading Irene's practice - this kind of writing journey requires a measure of discipline and dedication indeed. I met Irene once at a book signing. I'd love to have a copy of her poetry book for our poetry tea times! I do love that poem about your dad! Thanks for sharing, Amy and Irene. It's always fun to see not only your process, but also your journey. Thanks to both of you. 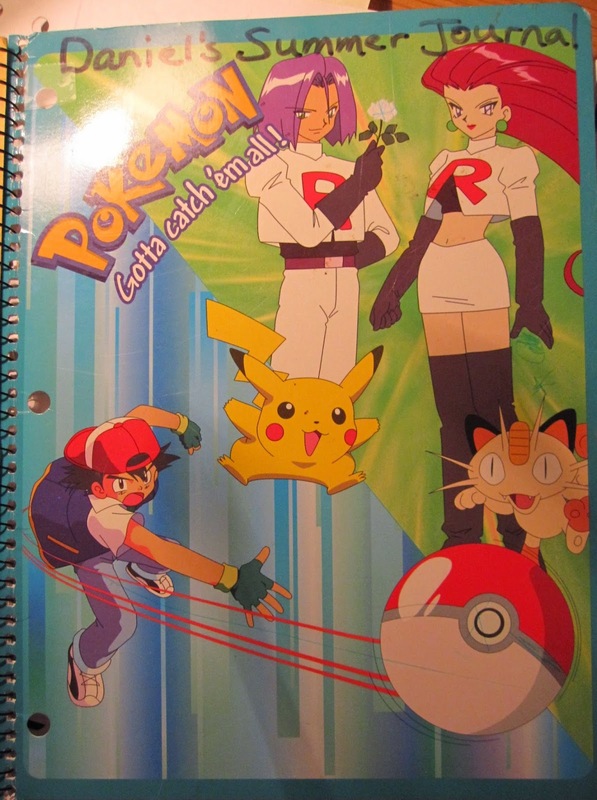 Irene, I also love the idea of keeping notebooks more than actually doing it on a regular basis. My attempts come in fits and starts, and those half filled student notebooks do come in handy! It's a blessing that you still have your earlier work and can re-connect with your girlhood thoughts this way. Thanks for sharing! Thanks for sharing your writing process with us and for the encouragement. 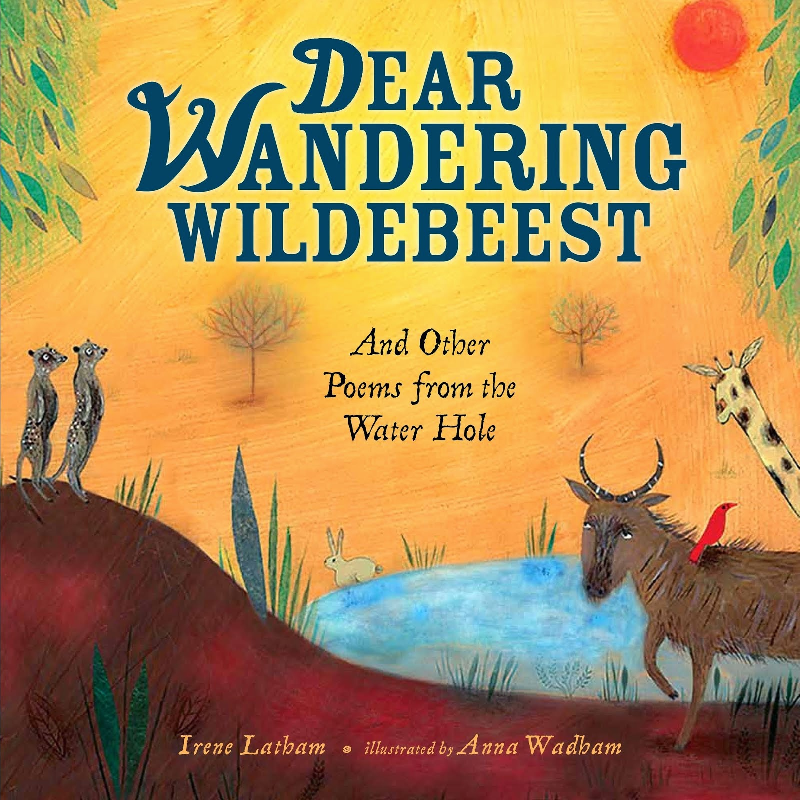 Please enter my name in the drawing for your new Kirkus Stared review book, DEAR WANDERING WILDEBEAST. I want to see Greg du Toit's photographs taken from in the watering hole. Who know's I might get the opportunity to meet him if he is still hanging out at the watering hole on my Kenya trip in Nov. I just did a web search on his name and he is a marvellous award-winning photographer and the photos on his web page are breath-taking. Thank you, thank you, thank you for this resource. 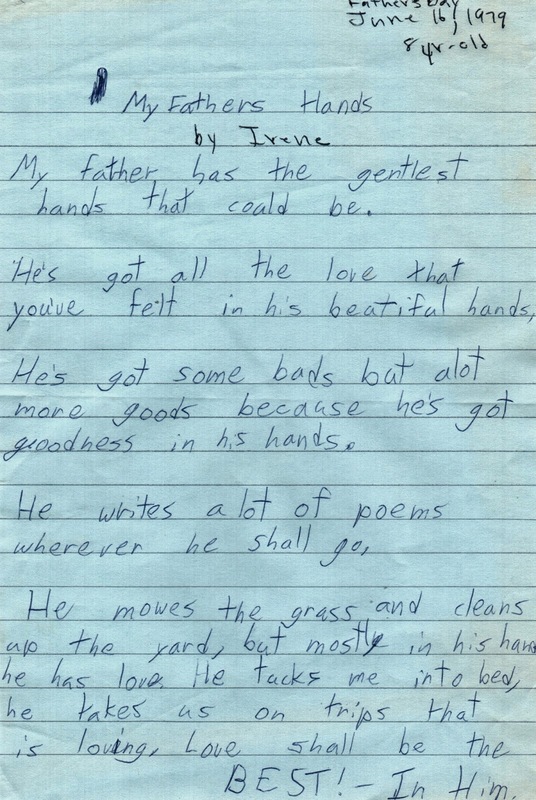 I'm coming way late to the party but as a dad, I loved the poem you wrote at 8 years old. I could only hope that if my kids were poets, they would say something similar about me. Heart strings officially tugged.